Tonight, we’re going to show you something that the world has never seen before. Tonight, we are going to reveal new and conclusive proof of the secret nuclear weapons program that Iran has been hiding for years from the international community in its secret atomic archive. We’re going to show you Iran’s secret nuclear files. Well, tonight, I’m here to tell you one thing: Iran lied. Big time. After signing the nuclear deal in 2015, Iran intensified its efforts to hide its secret nuclear files. In 2017, Iran moved its nuclear weapons files to a highly secret location in Tehran. This is the Shorabad District in southern Tehran. This is where they kept the atomic archives. Right here. Few Iranians knew where it was, very few, and also a few Israelis. Now, from the outside, this was an innocent looking compound. It looks like a dilapidated warehouse. But from the inside, it contained Iran’s secret atomic archives locked in massive files. Actually, they’re a little bigger than this, okay? A few weeks ago, in a great intelligence achievement, Israel obtained half a ton of the material inside these vaults. And here’s what we got. Fifty-five thousand pages. Another 55,000 files on 183 CDs. Everything you’re about to see, is an exact copy of the original Iranian material. You may want to know where are the originals? Well, I can say they’re now in a very safe place. Here’s what the files included: incriminating documents, incriminating charts, incriminating presentations, incriminating blueprints, incriminating photos, incriminating videos and more. We’ve shared this material with the United States, and the United States can vouch for its authenticity. We will also share it with other countries, and we’ll share it with the International Atomic Energy Agency. So, let me tell you the history of this material. We’ve known for years that Iran had a secret nuclear weapons program called Project Amad. We can now prove that Project Amad was a comprehensive program to design, build and test nuclear weapons. We can also prove that Iran is secretly storing Project Amad material to use at a time of its choice to develop nuclear weapons. Here’s what Project Amad’s explicit goal was: creating nuclear weapons. This is an original Iranian presentation from these files, and here’s the mission statement: Design, produce and test five warheads, each with ten kiloton TNT yield for integration on a missile. You don’t need to read Farso to read 10 kilotons here. TNT. This is the specific goal of Project Amad. That’s like five Hiroshima bombs to be put on ballistic missiles. This is an original Iranian spreadsheet from the archives of Project Amad. Look at what we have here. Yellowcake production, centrifuge enrichment prossess, warhead project, simulation project, and test. And indeed, when we analyzed what’s in these archives, we found that Project Amad had the all the five elements, the five key elements, of a nuclear weapons program. I want to take them one by one. The first element is designing nuclear weapons. This is an original Iranian illustration of a weapon. Again, you don’t have to read Farsi to understand this. This is U235—that’s enriched uranium, right here at the core. That’s the only place where you find in the core enriched uranium. And here’s an Iranian simulation, original Iranian simulation putting all these components together. That’s the first component. Second component—developing nuclear cores. Here’s a photo showing the casting process and a cast metal core, from the archives. And here’s a secret underground facility the Iranians were building to produce nuclear cores. We have hundreds of documents for each of these components. Third component—building nuclear implosion systems. This is an original Iranian photo of a measuring device for implosions. And here’s a simulation of a nuclear implosion. Fourth element—preparing nuclear tests. Here’s a map of five potential locations for a nuclear test in eastern Iran, One, two, three, four, five. We have many, many more such documents. And fifth—integrating nuclear weapons on missiles. Here’s a design for a nuclear payload on a Shahab3 missile, from the archive. Here’s the warhead, here’s the bomb. And I don’t have to remind you, I think, that Iran is continually expanding the range of its ballistic missiles, its nuclear-capable missiles. They started with 1,000 kilometers, they’re now up to 2,000, roughly. They can reach Riyadh, Tel Aviv, Moscow, but they’re working on far, far greater ranges. They’re planning much longer range missiles to carry nuclear weapons. So these files conclusively prove that Iran is brazenly lying when it says it never had a nuclear weapons program. The files prove that. But here’s what happened next. Iran was faced with mounting pressure in 2003. You remember that, that was following the Gulf War, so it was forced to shelve Project Amad. But it didn’t shelve its nuclear ambitions. So Iran devised a plan to do two things. First, to preserve the nuclear know-how from Project Amad, and second, to further develop its nuclear weapons related capabilities. That plan came directly from Iran’s top leadership. There’s another document from the archive. This is following the new directive of Iran’s Minister of Defense, Mr. Shamkhani, today he’s the director of the National Security Council. Following the new directive of Iran’s Minister of Defense, the work would be split into two parts, covert and overt. A key part of the plan was to form new organizations to continue the work. This is how Dr. Mohsen Fakhrizadeh, head of Project Amad, put it. Remember that name, Farhizadeh. So here’s his directive, right here. And he says: “The general aim is to announce the closure of Project Amad,” but then he adds, “Special activities”—you know what that is—“Special activities will be carried out under the title of scientific know-how developments.” And in fact, this is exactly what Iran proceeded to do. It continued this work in a series of organizations over the years, and today, in 2018, this work is carried out by SPND, that’s an organization inside Iran’s Defense Ministry. And you will not be surprised to hear that SPND is led by the same person that led Project Amad, Dr. Farhizadeh, and also, not coincidentally, many of SPND’s key personnel worked under Farhizadeh on Project Amad. So this atomic archive clearly shows that Iran planned, at the highest levels, to continue work related to nuclear weapons under different guises and using the same personnel. I want to give you another example of Iran’s nuclear weapons related activity that continued after Project Amad. You all remember the Fordow Facility? The Fordow Uranium Enrichment Facility. This was a secret underground enrichment facility that the Iranians built under a mountain. You don’t put thousands of centrifuges under a mountain to produce medical isotopes. You put them there for one reason: nuclear weapons, enrichment for nuclear weapons. But the files show that Fordow was designed from the get-go for nuclear weapons as part of Project Amad. Here’s an original Iranian blueprint of Fordow. And what happened was that Iran continued to build Fordow years, secretly building, years after Project Amad ended. Here’s what it looks like. That’s the entrance. It goes under a mountain. You also will not be surprised that Iran insisted on keeping Fordow. And amazingly, the nuclear deal enabled it to do it. It enabled it to do it, but this came with a hitch. Iran was required by the nuclear deal, to come clean to the International Atomic Energy Agency about its nuclear program. This was an explicit condition for implementing the nuclear deal. Iran has to come clean. So in December 2015, the IAEA published its final assessment of what it called the military aspects of Iran’s nuclear program. This is the report. This was Iran’s chance to fully come clean to the IAEA. They could tell the truth, they could say, we had this program, this secret program, it’s over, we shelved it, it doesn’t exist, we destroyed the material. Here’s what Iran actually told the IAEA. It said, Iran denied the existence of a coordinated program aimed at the development of a nuclear explosive device, and specifically denied, get this, specifically denied the existence of the Amad plan. The material proves otherwise, that Iran authorized, initiated and funded Project Amad, a coordinated program aimed at the development of a nuclear explosive device. Here’s another document from the archive. This is the master plan of Project Amad. Iran said to the IAEA, no work has been conducted with multi-point initiation. This is multi-point initiation. You’ve got to forgive me, this jargon, this scientific terminology is something that is necessary to understand the production of nuclear weapons. But here’s what they say, no work has been conducted with MPI technology in hemispherical geometry. But again, the archive shows that this is a complete fabrication. Iran conducted extensive work with MPI technology in hemispherical geometry. There’s an example. Hundreds more documents prove it. Iran said to the Agency, that it had not conducted metallurgical work specifically designed for a nuclear device. But the files again show that this is a lie. Iran conducted extensive metallurgical work specifically designed for a nuclear device. Here’s an original Iranian photo, plenty more in the archive. So what I’ve shown you tonight is just a fraction of the total material that we have. But even from this sample, you can draw four main conclusions. First, Iran lied about never having a nuclear weapons program. 100,000 secret files prove that they lied. Second, even after the deal, Iran continued to preserve and expand its nuclear weapons know-how for future use. Why would a terrorist regime hide and meticulously catalogue its secret nuclear files, if not to use them at a later date. Third, Iran lied again in 2015, when it didn’t come clean to the IAEA, as required by the nuclear deal. And finally, the Iran deal, the nuclear deal, is based on lies. It’s based on Iranian lies and Iranian deception. 100,000 files right here prove that they lied. Yes you did. Yes you do. And the atomic archive proves it. The nuclear deal gives Iran a clear pass to an atomic arsenal. It does so because it gives them the three components that are necessary to produce this arsenal. First, unlimited enrichment in a few years. And they plan to do that. They plan to have several hundred thousand advanced centrifuges with which they can enrich mountains of uranium for that core that I showed you before. For many, many such cores. Second, it completely fails to address Iran’s continued development of ballistic missiles. And third, and this is new, it completely fails to address Iran’s secret nuclear bomb program and its advanced work on weaponization. We just did. So this is a terrible deal. It should never have been concluded. And in a few days’ time, President Trump will decide, will make a decision on what to do with the nuclear deal. I’m sure he’ll do the right thing. The right thing for the United States, the right thing for Israel and the right thing for the peace of the world. President Obama on November 9, 2015 will host Israeli Prime Minister Benjamin Netanyahu at the White House. The President looks forward to discussing with the Prime Minister regional security issues, including implementation of the Joint Comprehensive Plan of Action to peacefully and verifiably prevent Iran from acquiring a nuclear weapon, and countering Tehran’s destabilizing activities. The President also looks forward to discussing Israel’s relations with the Palestinians, the situation in the Gaza Strip and the West Bank, and the need for the genuine advancement of a two-state solution. Prime Minister Netanyahu’s visit is a demonstration of the deep and enduring bonds between the United States and Israel as well as the unprecedented security cooperation, including our close consultations to further enhance Israel’s security. The Security Cabinet unanimously rejected the nuclear agreement with Iran and determined that Israel is not bound by it. The leading international powers have bet our collective future on a deal with the foremost sponsor of international terrorism. They’ve gambled that in ten years’ time, Iran’s terrorist regime will change while removing any incentive for it to do so. In fact, the deal gives Iran every incentive not to change. In the coming decade, the deal will reward Iran, the terrorist regime in Tehran, with hundreds of billions of dollars. This cash bonanza will fuel Iran’s terrorism worldwide, its aggression in the region and its efforts to destroy Israel, which are ongoing. Amazingly, this bad deal does not require Iran to cease its aggressive behavior in any way. And just last Friday, that aggression was on display for all to see. Now, this didn’t happen four years ago. It happened four days ago. Translation: Iran’s support for terrorism and subversion will actually increase after the deal. In addition to filling Iran’s terror war chest, this deal repeats the mistakes made with North Korea. There too we were assured that inspections and verifications would prevent a rogue regime from developing nuclear weapons. By not dismantling Iran’s nuclear program, in a decade this deal will give an unreformed, unrepentant and far richer terrorist regime the capacity to produce many nuclear bombs, in fact an entire nuclear arsenal with the means to deliver it. What a stunning historic mistake! 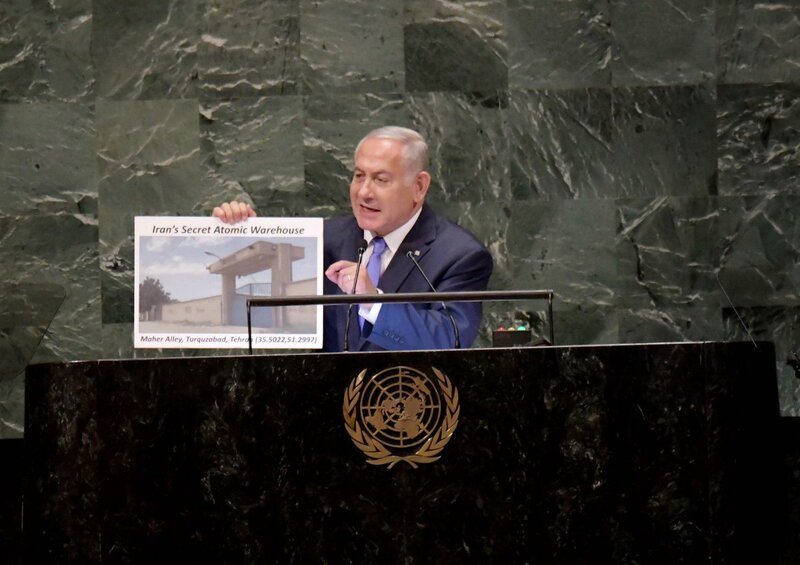 Israel is not bound by this deal with Iran and Israel is not bound by this deal with Iran because Iran continues to seek our destruction. We will always defend ourselves.